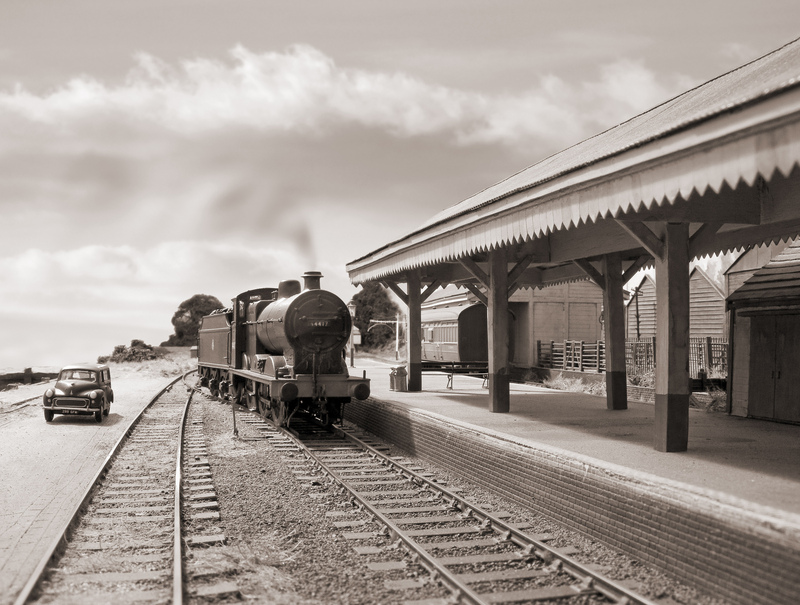 Chris Nevard Model Railways Blog: Time machine? Here we are back at Combwich looking south into the midday sun, it looking like a windy day judging by those clouds. A little flare from the sun has been captured unfortunately across the smokebox door of 44417, the result of not using a lens hood. The loco has just arrived with the morning goods from Evercreech Junction, but because it's a couple of hours until the next passenger train and the shunter is having lunch, the engine will probably be taken along to the shed for a pit stop before shunting its bounty out of the platform road into the goods yard. Scenes like this were once every day 50 or so years ago, and era when life was probably alot slower and simpler than it is today, or so my parents tell me who are from those times. I'm sure that there are few who wouldn't jump into a time machine for a few hours or even days to sample this little slice of lost Britain. But I wonder how many of us under the age of 50 would be able to cope with pre decimal currency when the landlord asked you for one shilling and thrupence and the local shop keeper 9d for a Mars Bar? Personally I'd put on a strange accent and act foreign to get around this issue. Clever people would simply take a pensioner with them or swat up before hand of course! Finescale modellers will I hope notice my nod to the Model Railway Journal with the typeface used here - I think quite suitable for this post. Acksherley, Model Railway Journal uses Bembo. RWJ writing this in the Pedant & Armchair. They have WiFi there now! Mother won't let met have the internet because of all the pr0n on it. Richard, you have an uncanny knack for this! I'd have been more impressed if you'd used Bembo scribed by hand by monks as the real Village Journal does. Chris, it's called not having a life. My collection of books on typography is testament to this. A very good image, great lighting Chris. May I ask, are you using Lightroom, Photoshop or Aperture for your conversion to black and white?